The goal of this article is to advise our commercial readers and visitors that you can clean laminate floor with water only. That is correct; you can clean a laminate floor with water only and a floor pad. With the huge increase in laminate flooring be installed in commercial buildings from retail stores to Sports Arenas, cleaning laminate floors is becoming a common question for commercial end users. If you go to many laminate manufacturers’ websites, they advise using vinegar or plain water to clean their laminate floor. For residential homeowners, with no children or pets and leaving on the top floor of an apartment complex, using plain water may work to clean the laminate floor. However, for the commercial end-user, using plain water without a cleaning product simply won’t work. The foot traffic in commercial buildings is just too great to try to keep the laminate floor clean with just water…until now. There is a cleaning floor pad that has hit the market place called the “that’s Amazing” Floor Cleaning Pad. When used on a cleaning machine such as an automatic scrubber or single disc floor machine along with plain water, the results are excellent and in fact it is better than a floor cleaner and a standard fiber pad. The “That’s Amazing” Floor Cleaning Pad is a special pad made from a special foam material that actually grabs soil and removes it from the floor with using plain water. It works similar to the Mr. Clean Magic Eraser Pad but in a floor pad design that comes in three different diameter sizes of 13”, 17”and 20”. This makes the Floor pad cost saving product because of the elimination of a floor cleaning product but perhaps more importantly it makes the “That’s Amazing” Floor Cleaning Pad a green way of cleaning. 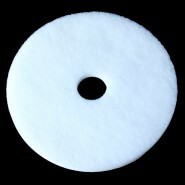 Below you can find contact information where to purchase the “That’s Amazing” Floor Cleaning Pads. Dust Mop the floor and remove attached debris with a blunt plastic scraper. Using an automatic scrubber filled with plain water equipped with the “That’s Amazing” Floor Cleaning Pad. Making a single pass with the automatic scrubber with the solution valve open half-way, the squeegee down, vacuum on and floor pads down, scrub clean the laminate floor. Allow floor to dry thoroughly before allowing traffic on the floor.